It doesn’t matter whether you have five employees or five hundred, if you want your business to be successful, you should do all you can to make your employees feel valued and appreciated. One way of doing this, is to make sure that the working environment you offer, is appealing and meets the needs of all your employees. The best companies to work for, have communal areas for their workers that allow them to take time out and have fun. Whether it’s a corner of your office, or a separate room, why not have a pool table, table tennis table and some comfy seating? It can make a big difference to employee morale and can be a place everyone enjoys visiting, whether it’s for ten minutes, or their full lunch hour. 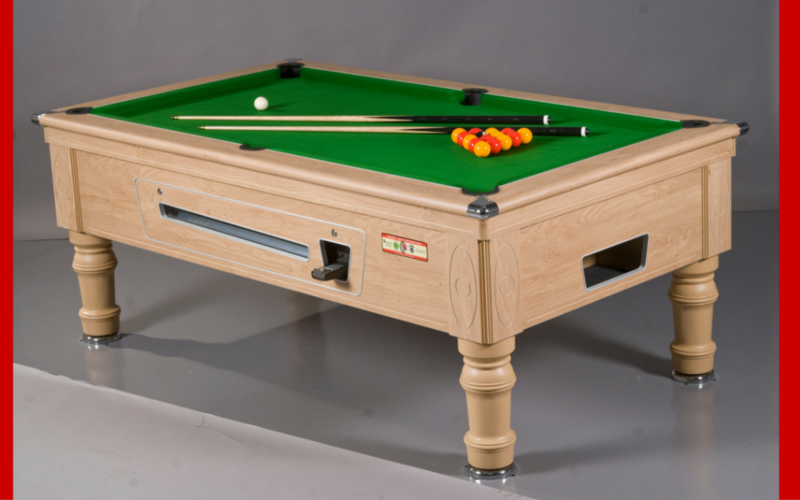 If you have a large canteen or kitchen area, fitting in a pool table or TV with games console shouldn’t be a problem. Having a communal area, that appeals to your workers’ inner child, and allows them to have some healthy competition, can benefit both their physical and mental wellbeing. You don’t want employees to be chained to their desks, so why not hire a pool table today? It doesn’t cost very much to do so. 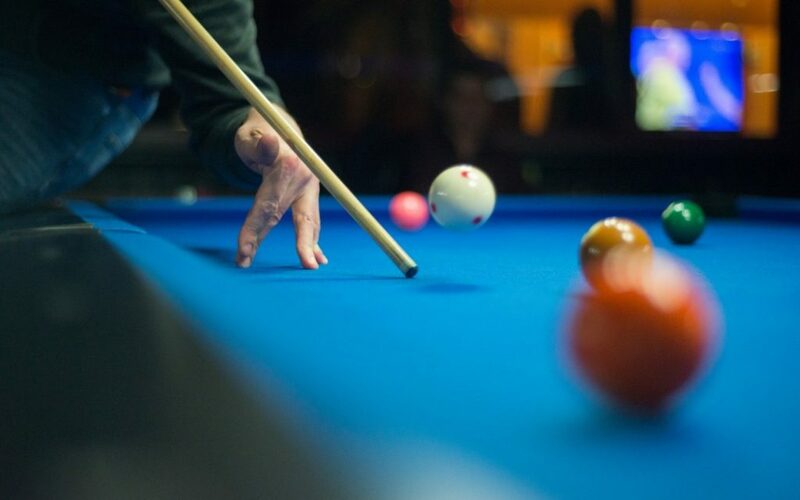 Give us a call on 0161 870 7777 and we can arrange a pool table for you pronto. As well as thinking of how employees can be entertained in the communal area, you should spend time considering the décor and how you can make it feel different to the rest of the workspace. If the rest of the workspace is relatively bland and business-like, you want to try to be more creative and fresh in the communal area, so that employees see it as a place of retreat and escape. Why not consider some bold prints on your seating or a statement wall that packs a punch? Having some framed photos of your team can be nice touch, and a noticeboard to post up information about events coming up too. If you want to get the most from your communal area, ask employees what they’d like, and let them feel involved. You never know, they might be up for decorating the area after work one night, if you provide the drinks! Is your pub pool table a Prince or a Winner? When you hire a pub pool table from Manco Automatics, you have plenty of choice about what style and colour of pool table you get, but in particular you can choose from two leading models: Prince and Winner. Prince pool tables are more traditional looking, with turned wood-effect legs and laminate casing, in a choice of finishes including traditional oak and walnut – all of which should look perfectly at home in a typical pub setting. Winner pool tables, on the other hand, have a more ‘modern’ appearance, with angled legs and a choice of finishes you might expect to see in a sports bar or an American pool hall. There are still wood laminates like walnut available, but also metallic aluminium and polished marble-effect surfaces that offer an eye-catching departure from the turned wood-effect pedestals of Prince pool tables. 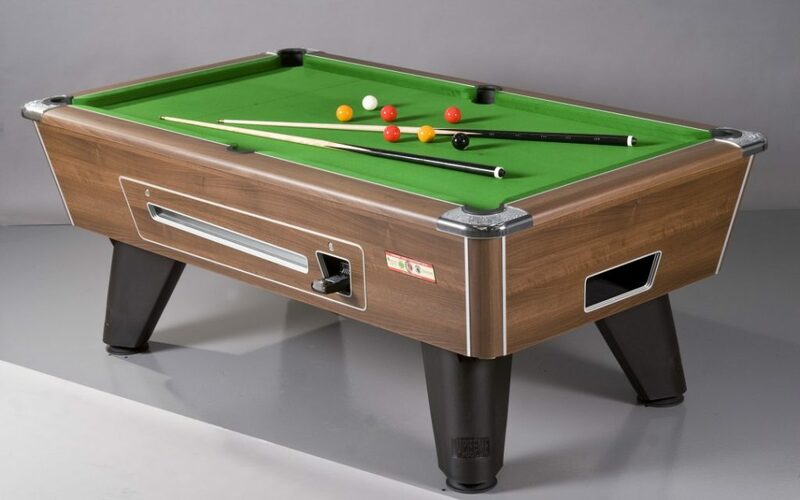 In terms of the playing surface, both brands make excellent pub pool tables, and you have the same wide choice of fabrics from classic green to blue, red, purple, grey, black and a host of other shades. Either brand’s pool tables can also be fitted with Simonis speed cloth, again in a variety of vivid colours, so that you can host more competitive matches and even tournaments if you wish. You might already have a clear idea of the kind of visual style you want your hired pub pool table to have – and in many cases the classic wood finish of a Prince pool table with green baize will suit the widest range of typical British establishments. But if you want to attract a younger crowd, or perhaps appeal to slightly more experienced pool players who follow the sport in televised tournaments, Winner pool tables could be the way to go. You might even end up hosting a regular local league or tournament, which can be a great way to score some free publicity from the local press if you take a few photos of the winner and runners-up. Our pub pool tables are available on a profit-share basis, so if you are not certain of what will work for you, we can advise on what we think will look best as part of your venue’s interior. Aside from the Christmas and New Year holiday season, the longer lighter evenings of summer are a major boost for the pub trade, but when the sun goes down you risk losing that extra trade in one mass exodus from your beer garden. Pool tables are a great way to provide punters with a reason to stay for longer, and there’s a naturally good fit between the groups of friends who typically hit the beer garden, and the kinds of people who like to play pool too. Manco Automatics can supply two of the leading brands of pub pool tables – Winner and Prince – including the option of a profit-share arrangement if you don’t want a cost to cover upfront. Winner pool tables have more of an American bar feel to the design, with angled legs and chunky curved cushions, making them ideal for a younger crowd or if you run a sports bar or want to embrace the transatlantic style of them. Prince pool tables, on the other hand, generally have a flatter surround to the cushions, with a more traditional pedestal design to the legs too, and this might be more appropriate in traditional pubs and clubs. There’s no reason not to choose whichever style you prefer though – trust your own decision-making instincts and you’re most likely to opt for a pool table that will impress your customers. You have a few other options too, including a wide range of different colours both for the table legs and cushion edges, and for the cloth that covers the slate bed. 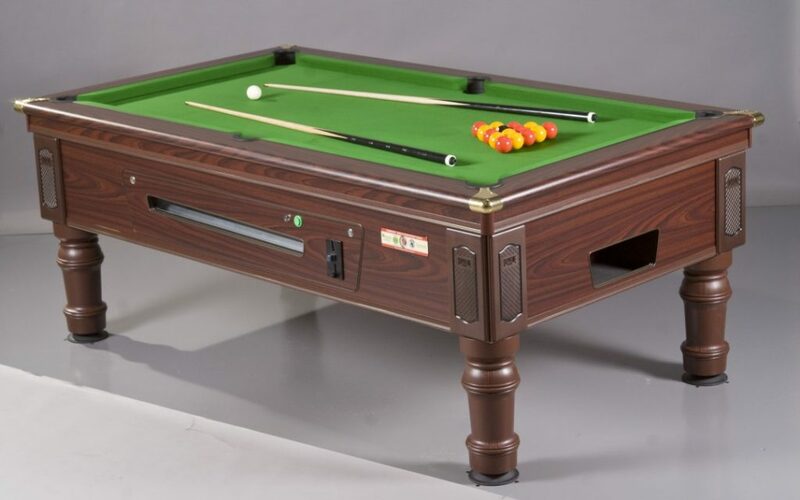 Tables can be supplied with either an electronic or mechanical coin validator, and the price per game is adjustable, so it can be set to suit your customers – helping you to keep them on your premises for as long as possible after the sun goes down, and maximising your profits both from your pool table and from drinks sales too. Firstly we’d to take this opportunity to wish all our customers, staff, friends and followers a very happy Christmas. 2015 has been a big year for us and we couldn’t have achieved half of what we did without you, so thank you! 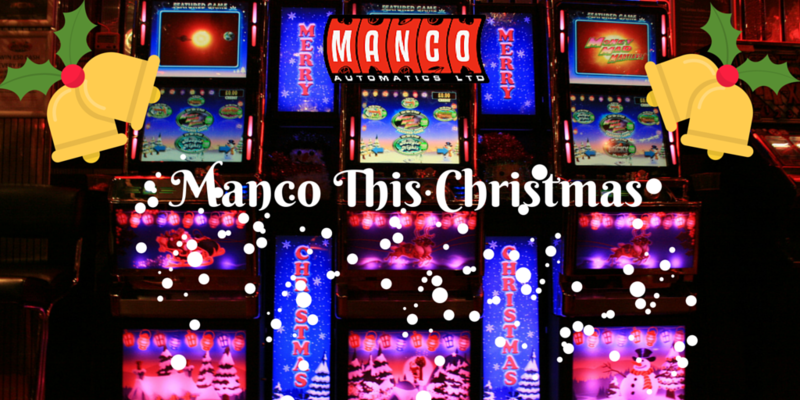 We’re not looking for any awards here, but we would like to share with you what goes on behind the bright lights of Christmas for the Manco team. As we provide many of the North West’s pubs, clubs, bingo halls and other social venues with themed fruit machines, Juke Boxes loaded with Christmas songs and very popular pool tables, we tend to be the fourth or maybe fifth emergency service to our customers, over the festive period. Most of us will have witnessed The Pogues belting out at the local, the crowd around the pool table or the determined fruit machine master trying to land that elusive jackpot. All things that mean higher footfall and higher profits for the relevant establishment at this time of year, if properly maintained. It’s our job to keep the fun alive by being on hand to help with any issues and make sure all machines and tables are kept in perfect working order, no matter what time of year it is. We’re on hand every day over Christmas and New Year (apart from Christmas day) to ensure our clients and their clients get the level of service they expect so that The Pogues can play on without a hitch. If your provider doesn’t operate these hours over Christmas and you need assistance, we’d welcome your call. If you’re looking for maintenance, or even new machines then we can help. Our engineers are able to make onsite repairs, replace machines, re-cloth pool tables and ensure heavily used machines are emptied of coins when needed, to ensure a fun, secure and profitable process throughout. So don’t delay, give us a call on 0161 870 7777 and make a change for 2016. We’ll be glad to hear from you. With lots of drink being consumed and plenty of time off work spent socialising we hope you all drink and gamble responsibly and stay safe this Christmas. Leeds punters were bemoaning the loss of one of the city’s best-loved sun terraces earlier this year, but pub pool tables and outdoor games could soon bring back the sunshine. The Yorkshire Evening Post’s City Buzz column reports the disappointment that accompanied the closure of The Lounge on the city’s Merrion Street. “With summer just around the corner we were starting to panic at the thought of losing another city centre sun terrace,” the publication explains. The team behind Roxy Ballroom have spoken exclusively to City Buzz, revealing plans to reopen the venue under the name Slate. It would be a dedicated pool bar – with a combination of pub pool tables and potentially outdoor games to make the most of that much-loved sun terrace. Jones Bar Group’s managing director Matt Jones said: “It will have a Victorian feel, to fit in with the building, and is completely different to our other ventures so far. For information on pub pool table hire, contact Manco Automatics today!